North Korea's fifth nuclear test on 9 September has left newspapers pondering the dangerous road ahead. South Korean papers are torn between regime change in the North and encouraging international cooperation on the issue. Some papers in the region call for China to wield its influence on Pyongyang. Seoul's Chosun Ilbo newspaper says regime change is the only option. "What is needed now is a concerted effort to topple Kim Jong-un by fomenting internal unrest in every way possible," the paper says. Conservative Dong-A Ilbo also calls for Kim's removal: "Now that it has become clear the North Korean nuclear issue cannot be resolved while leaving Kim Jong-un intact." Other papers think there is space for sanctions, with Chinese support. "It's China that holds the key to maintaining peace in Northeast Asia amid the escalating nuclear threats from the North," says the Korea Times. Centre left-daily The Hankyoreh calls for an end to sabre-rattling: "We need to get past our antagonistic, Cold War-style logic. Instead of pinning vague hopes on a North Korea collapse scenario, we need a strategic approach that can lead to a comprehensive solution." Joongang Ilbo accuses world powers of not enforcing sanctions, giving Pyongyang breathing space. "If the world wants to address the North Korean nuclear issue through sanctions, it must push the country into a very tight corner," it says. Korea Herald agrees, recognising the need to convince Beijing to implement sanctions. "Chances are quite slim that the Kim Jong-un regime will scrap its nuke development as long as Beijing allows it to continue," it says. Japan is under direct threat of North Korean ballistic missiles, and efforts should be stepped up to end its nuclear programme, Japan's Mainichi Shimbun says, blaming patchy sanctions and a failed American strategy. 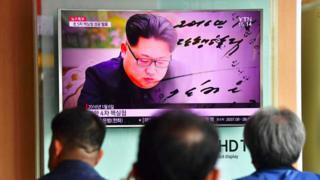 "North Korea is fully aware that the international community is in a gridlock in further stepping up sanctions. There is no denying the US policy of 'strategic patience' has ended up allowing Pyongyang to go ahead with its nuclear development." The Japan News, the English version of Yomiuri Shimbun called for a rethink of the country's defence capacity: "Japan must urgently build a tight defence system by promoting joint cooperation between the Self-Defence Forces and US military, and expanding and improving the nation's missile defence system." China's media called on foreign nations to change their approach to dealing with Pyongyang. The official People's Daily says the "international community must alter its approach to the Korean Peninsula to avoid a dead end". "Mutual suspicion is the root cause of the North Korean nuclear issue, a symptom left over from the Cold War," it adds, stressing that the US, South Korea and Japan need to change their attitudes. Nationalist newspaper Global Times criticises US Defence Secretary Ash Carter for blaming China for the latest nuclear threat. "Without the reckless military threat from the US and South Korea... Pyongyang may not have developed such a firm intent to develop nuclear weapons as now," the paper snipes back. Global Times bemoans Pyongyang's "zero" diplomacy which makes it difficult for Beijing to get North Korea to pay attention on the issue. "We sincerely hope North Korea is aware of the situation and is open to advice," Global Times concludes. In Russia, which shares a border with North Korea, business daily Vedomosti recognises Russia has "no serious levers of influence on North Korea, while China has". However, Chinese action seems unlikely as it is playing a greater game, the paper thinks. "Beijing considers itself to be deceived after the US decided to deploy its missile-defence system in South Korea, and so it connives at the implementation of sanctions." With Washington announcing a bomber flight over the Korean peninsula on 13 September, opinion is split as to whether shows of force or diplomacy are more effective.